Carter was an English archaeologist and Egyptologist who devoted his life to archaeology. He first travelled to Egypt in 1891, where he held several archaeological positions, until in 1907 he was privately funded by the English aristocrat Lord Canarvon to carry out work at Canarvon's excavation sites. This work was interrupted by World War One, but resumed immediately after. In 1922, growing tired of the lack of results Canarvon offered Carter one more year of funding. On the 4th of November 1922 Carter discovered the entrance to the tomb of Tutankhamun. 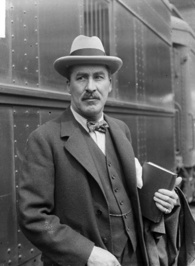 This discovery immediately gained international attention, and huge crowds fl Howard Carter is best known for his discovery of the tomb of the 14th century BCE Egyptian pharaoh Tutankhamun. On the 4th of November 1922 Carter discovered the entrance to the tomb of Tutankhamun. This discovery immediately gained international attention, and huge crowds flocked to see the tomb. This was the first intact ancient, royal Egyptian discovered. The immensely demanding task of excavating and examining the artefacts continued for several years, amidst a great amount of controversy and difficulties.